What is the effect of mortgage debt reductions that reduce payments in the long-term but not in the short-term? In a new paper using data from a recent government mortgage modification program, we find that substantial mortgage principal reductions that left short-term payments unchanged had no effect on default or consumption for "underwater" borrowers who owed more on their home than their homes were worth. This finding is significant because the design of mortgage modification programs was a key question facing policymakers attempting to help struggling households during the Great Recession. Policymakers faced a choice between debt reductions that focused on borrower liquidity by temporarily reducing mortgage payments or debt reductions that focused on borrower solvency by permanently forgiving mortgage debt. This normative policy debate hinged on fundamental economic questions about the effect of long-term debt obligations on borrowers' default and consumption decisions. While a large academic literature has examined the effect debt reductions that mix both short and long-term payment reductions, little is known about the specific effects of long-term debt obligations. To help fill this gap, we compared underwater borrowers who received two types of modifications in the federal government's Home Affordable Modification Program (HAMP). Both modification types resulted in identical payment reductions for the first five years. However, one group also received $70,000 in mortgage principal reduction, which translated into increased home equity and substantial long-term payment relief. By comparing borrowers in each of these modification types, we were able to isolate the effects of long-run debt levels holding fixed short-run payments. An important feature of the policy we studied was that borrowers remained underwater even after substantial debt forgiveness. To compare these borrowers, we built two new datasets with information on borrower outcomes and HAMP participation. Our first dataset matched administrative data on HAMP participants to monthly consumer credit bureau records from Transunion. Our second dataset used de-identified data assembled by the JPMorgan Chase Institute (JPMCI) that included mortgage, credit card, and checking account information for borrowers who received HAMP modification from Chase. 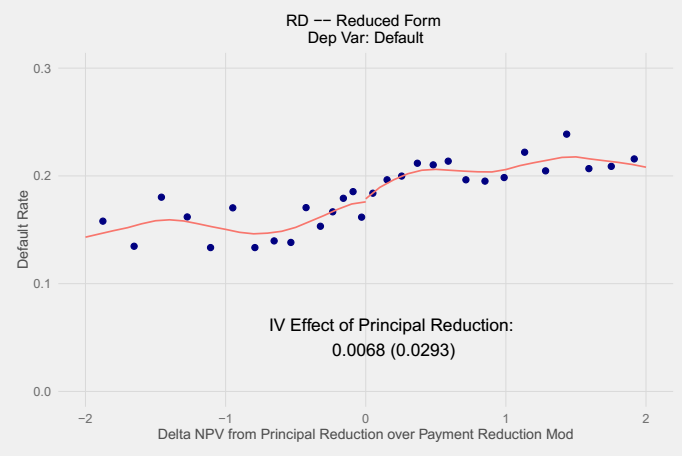 Using an empirical strategy called a regression discontinuity design, we found that principal reduction has no effect on default. The analysis exploited a cutoff rule in a model used by mortgage servicers to assign borrowers between the two modification types. While borrowers just above the cutoff were 41 percentage points more likely to receive principal reduction than those just below the cutoff, default rates were smooth at the cutoff, which indicates that principal reduction had little effect on default (Figures 1 and 2). We also estimated that even at the upper bound of our confidence interval, the government spent $800,000 per avoided foreclosure. This is over an order of magnitude greater than estimates of the social cost of foreclosures. 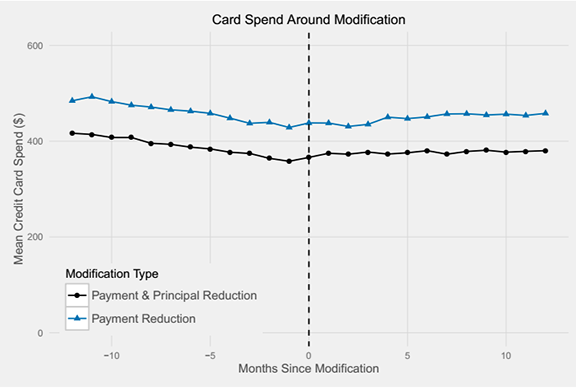 In the second part of our empirical analysis, we examined the effect of principal reduction on consumption by comparing the monthly spending of the two groups of borrowers over time. We showed that these two groups of borrowers were similar before modification on a broad range of observable characteristics, and that their credit card and auto spending measures were trending similarly in the months before modification. This means that the payment reduction group could be used as a valid counterfactual control group for the principal reduction group. We found that $70,000 in principal reduction had no significant impact on underwater borrowers' credit card or auto expenditure (Figure 3). 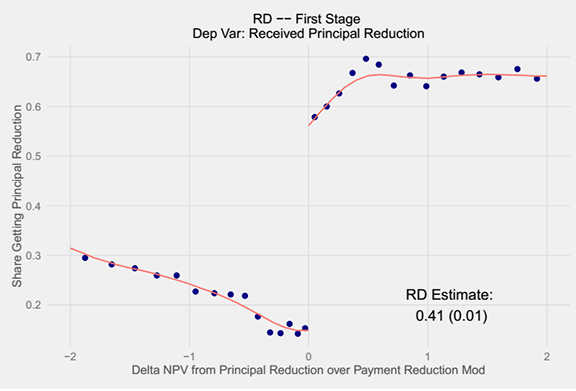 Although the spending of both groups stabilized after modification (consistent with the idea that short-term payment reductions helped borrowers), the group that received the additional principal forgiveness showed no differential effect. Rather, we estimated for each $1 of principal reduction received by borrowers, their total spending increased by only 0.2 cents. This is an order of magnitude smaller than the consumption response for average homeowners examined in prior studies, which typically have found spending increases between 4 and 9 cents per $1 of wealth increase. The inability of underwater borrowers to borrow against the housing wealth gains from principal reduction may explain why they were far less sensitive to housing wealth changes than borrowers in other economic conditions. Typically, housing wealth gains expand borrowers' credit access--in fact, prior research has found that equity withdrawal through increased borrowing may account for the entire effect of housing wealth on spending between 2002 and 2006. But if homeowners need positive home equity in order to borrow against their house, then principal reduction that still leaves borrowers underwater or nearly underwater will fail to free up collateral that can be used to finance new consumption. This limitation helps explain why policies to lower current mortgage payments were more effective than principal reductions at increasing consumer spending during the Great Recession.